Thursday, 9/7/2017: As I cross from Mississippi into Louisiana, WWOZ – “the most indispensable radio station in the country” – plays the instantly recognizable opening guitar riff of the Rolling Stones’ “Gimme Shelter” and my spirits lift immediately (www.wwoz.org). I am traveling to New Orleans to present a paper on Joan Didion’s California at the American Literature Association’s symposium, “Regionalism and Place in American Literature” (www.americanliteratureassociation.org). I love the Stones and am rocking out and singing along behind the steering wheel as I pull into the Louisiana Welcome Center north of Slidell. However, since I am aware of criticism over the past several years that WWOZ has sometimes strayed from its mission of promoting local New Orleans and Louisiana music, I wonder how “Gimme Shelter” fits into the scenario. I don’t much care at the moment since I am immersed in one of my favorite songs from arguably my favorite rock ’n’ roll band ever. I muse that it may be a reference to the fact that Texans and west Louisianans are seeking dry ground after Hurricane Harvey or that Floridians and others on the east coast are fleeing the approach of Hurricane Irma. 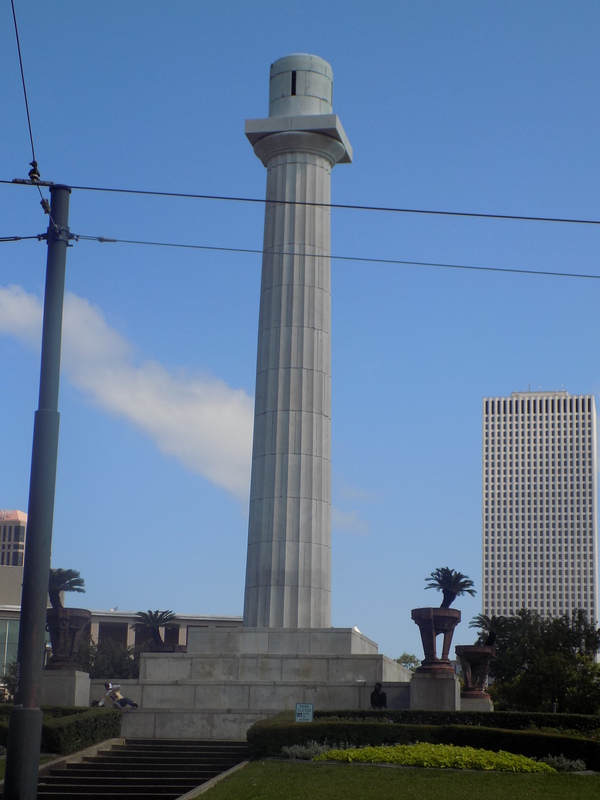 For either group, New Orleans is a place that is not in the crosshairs of the storm this time. Instead of calling them “medians,” New Orleanians refer to the grassy strips between lanes on their broad streets as “neutral ground.” On St. Charles Avenue, for example, the grassy area in the middle that the streetcars travel is “neutral ground.” I realize that in the current tropical storm scenario, the whole city of New Orleans is “neutral ground” with visitors coming in from all directions. The Stones wrap up and immediately the track segues to Merry Clayton’s solo version of “Gimme Shelter” and it all makes sense. Clayton, a New Orleans native, provides the fierce back-up vocals on the Stones’ original of the song, challenging Mick Jagger’s dominance in the process. Her solo version, recorded a few years later with a shrieking horn back-up, is a skillful and equally naked vocal performance. You must give it a listen. Getting out of the car, I am approached by an agitated man who tells me to give him gas money to get back to Beaumont. I am inclined to help him but I feel a need to engage him for a moment to see if he’s really a flood victim or if he’s scamming. “BYE!” and he’s gone, approaching another car just pulling up. A half hour later I am at the Hotel Monteleone, check into my room (which happens to be across the hall from the Tennessee Williams Suite), and unpack. There is a little time before the symposium’s registration and opening reception so I go to Faulkner House Books in Pirates Alley off Jackson Square (www.faulknerhousebooks.com). The proprietor is talking to a group of European customers. One is particularly interested in reading Faulkner and asks what he should start with. I walk past and whisper “As I Lay Dying” to the proprietor and the conversation continues as I browse. The ill-informed tour moves on. “Should I chase him down?” I ask, joking. “If I chased down every tour guide who gave false information in that alley, I’d never get any work done,” is the reply. I find the book I am looking for at Faulkner House, pay, and am leaving as the European guy decides to try a book of Faulkner’s short stories (good move). I stop by Napoleon House, one of my favorite spots in the French Quarter, and text my friend Deb that I am there; it is one of her favorite spots, too. Her response includes the terrible news that one of her good friends, a woman in her forties that I also know, has died. 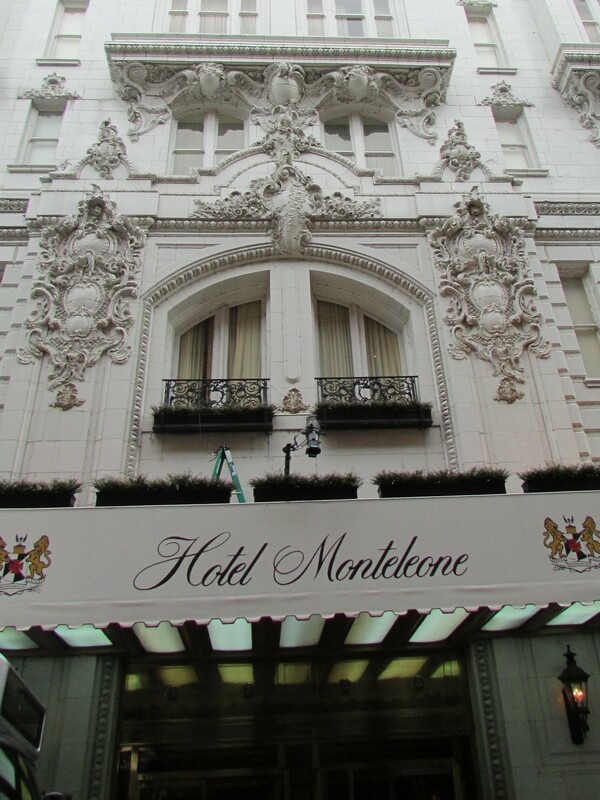 I absorb that piece of sad news and move back to the Monteleone, symposium check-in, and the reception. After a quick appearance at the reception, I get dressed for dinner. 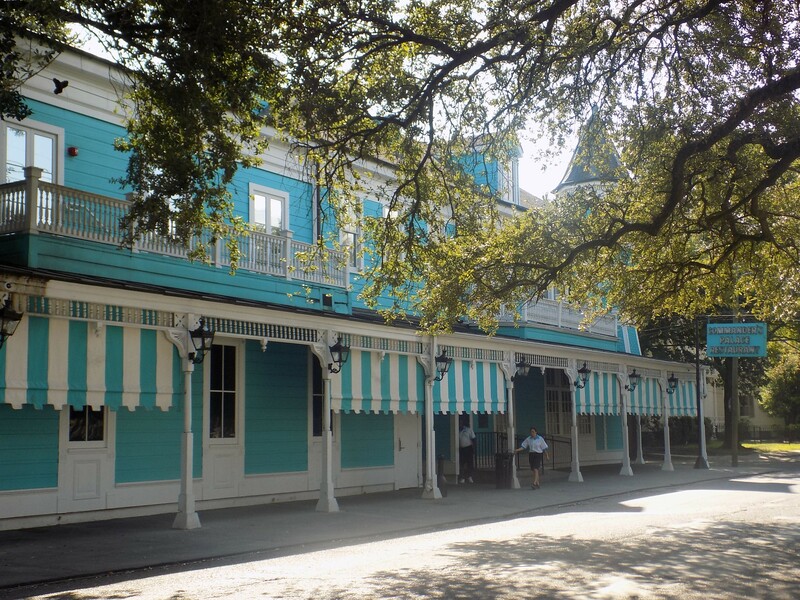 I am going to Commander’s Palace, in the Garden District. It is my habit on New Orleans trips to try to have dinner at one of the New Orleans classics, at one of my favorites, and at some place new. Commander’s Palace (www.commanderspalace.com) is one of the stalwart classics that I have never dined at. After recently viewing a charming documentary, Ella Brennan: Commanding the Table, I decided I could not delay a trip to Commander’s any longer so this will be my first visit to the turquoise landmark. Commander’s vaunted hospitality is alive and well and I am greeted warmly by every staff member as I make my way to my table in an elegant dining room. I have often said I would like to write a column or book about the “solo diner” and I always find that the best restaurants in New Orleans have no problem making a solo diner feel comfortable. I judge a restaurant partially by its treatment of solo diners and, with only one notable exception, New Orleans comes through splendidly. The tempting menu is full of tasty offerings, making it hard to choose what to have from Executive Chef Tory McPhail’s selections. The waiter, upon learning that Birmingham is my home town, asks me if I know the Bright Star in Bessemer where the late summer “Taste of New Orleans” event features a guest chef from a New Orleans restaurant. I tell him that I know the Bright Star very well and have attended Chef McPhail’s dinners there. Finally, I order a group of “tried and trues.” As I choose a meal of turtle soup, pecan-crusted Gulf fish, and bread pudding soufflé, the waiter smiles and says “a Paul Prudhomme meal.” Prudhomme sealed his reputation at Commander’s where his tenure preceded Emeril Lagasse, Jamie Shannon, and McPhail. He introduced Cajun influences to Commander’s – making Cajun food a national sensation – before going on to open his iconic restaurant, K-Paul’s, in the Quarter. The dinner is lovely and the ambiance is magnificent but I have a long day of presenting and listening tomorrow and, leaving Commander’s, I retreat to my room to practice my presentation one more time before sleep. Friday, 9/8/2017: After the symposium’s opening plenary session, in which it is announced that a number of presenters cannot make it to New Orleans due to impending weather, I present my Didion paper at the “California” session at 10:30. It goes well, I think. I field a lot of questions during the Q and A that follows. Lunch follows that, and then sessions that stretch to 7:30. Papers on the “undead” seem to be trending; these I avoid. There is impressive scholarship at the symposium and I hear a lot of good papers, but by the time the day wraps up I am famished and have made no dinner plans. I remember that I have time to get to Willa Jean (www.willajean.com), the new-ish restaurant (2015) in the Warehouse District that I learned about at a recent Alabama Chanin event in Florence. The restaurant is helmed by Chef Kelly Fields, who named it after her grandmother, and the general manager is Leah Richard, who I met and was terribly amused by at the Florence dinner. It is part of the ubiquitous John Besh Restaurant Group of New Orleans restaurants that impressively cover New Orleans like kudzu covers the South. Willa Jean is a shiny spot, sleek and chic with wood accents. The menu is inventive and fun, with offerings like Cookies + Milk and a wo’Manwich and an impressive selection of juice-based drinks. An array of enticing pastries is available just inside. I opt for the WJ Burger, an Angus beef burger with herb/pecorino fries. The burger is offered with American cheese but I ask to substitute the menu’s pimento cheese for American. The dessert menu provides too many tasty options and I finally choose a chocolate pudding generously sprinkled with crushed pecans. 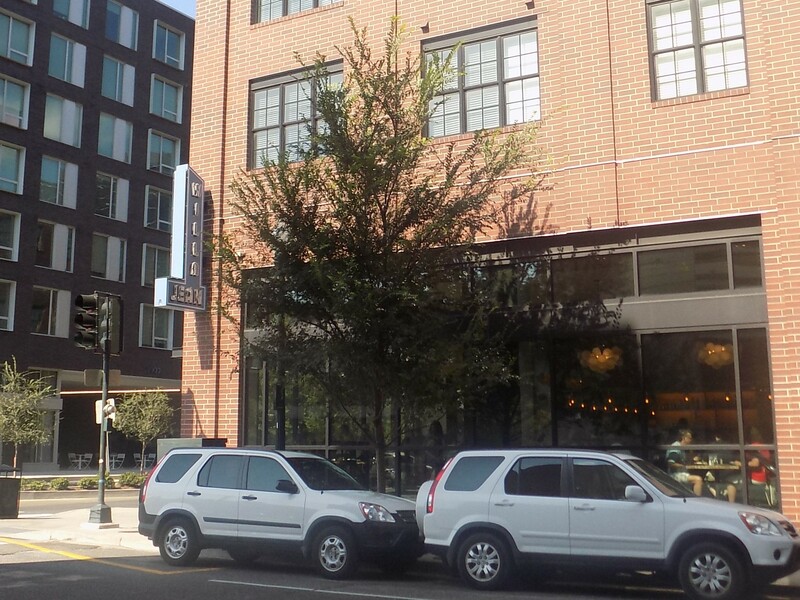 I notice how young the wait staff – the entire staff – is at Willa Jean. It’s not unusual to see older waiters in New Orleans where it is a career choice rather than a part-time job, but Willa Jean is full of attractive fresh young faces. Looking around the room, I realize that I am at least 25 years older than everybody in sight. As I leave, a three-some arrives that looks my age (or older) and I am relieved as I decide to walk back through the Central Business District and to the hotel. Streets that used to be dark and somewhat deserted in the CBD are now bustling, with new restaurants and other establishments on almost every block. In a late summer evening, there are groups of people chatting and walking, going into lofts and coming out for a night in the city. My first post-Katrina visit to New Orleans was a mere four and a half months after the flood when many areas were still without power and some places looked like the flooding had been days, rather than months, ago. It is heartening to see what much of the city has become (although there is still plenty of recovery left to do) on each visit back. I get back to the Quarter and consider going in search of live music but I realize that the Quarter on a Friday night has become, for me, as depressing as a New Year’s Eve party – too many people too desperate to have too good a time. Maybe it’s my age. I retreat into the more staid Monteleone where the crowd at the Carousel Lounge is getting geared up for a late evening of carousing. Saturday, 9/9/2017: It’s the final day of the symposium and I start the day at the second of two sessions on New Orleans regional literature with impressive papers by college students – one on Faulkner’s Absalom, Absalom! and another focusing on Kate Chopin’s The Awakening. At another session that I am looking forward to, I am disappointed. The session is supposed to deal with native cultures in the Americas and the four presenters have topics of interest to me. The first paper deals with Nahua structures in central Mexico and the presenter has time to give her entire presentation. However, the second presenter announces that she is an Elder of the Apache Nation and that she is going to use her status as entitlement to go beyond her allotted time. It is a shocking moment and the moderator should step in but doesn’t. Everyone sits politely as the Elder inserts lengthy asides and largely toots her own horn of accomplishments and vents her anger at the plights of the native cultures. It is the sole uncollegial moment in what is a very collegial symposium. When the Elder finally reels herself in, there are only minutes left for the final two presenters to sketchily synopsize what their work entails. The last two papers – one about hymns written in indigenous languages and another about tribal performance as theatre – were of particular interest to me and I am sorry I am not allowed to hear them due to a brazen and unprofessional power play. At a reception later, I have the opportunity to tell the presenter who was supposed to talk about her hymn research that I had wanted to hear her paper. “Thank you. I wanted to present it,” she graciously replies. I admire her calm in the situation. I am livid still. After lunch, I sneak away to my favorite New Orleans gallery up the street from the hotel. Elliott Gallery (www.elliottgallery.com) is owned by Catherine Martens Betz, who is knowledgeable and pleasant. It is at Elliott Gallery that I first learned about and developed a great affection for the French abstract artist, James Coignard (1925-2008), who had a studio for a time in New Orleans. Elliott Gallery offers the largest collection of his work in the world and I must visit it whenever I am in New Orleans. On this visit, Catherine is closely watching the weather radar since Irma has not yet made the predicted northward turn. If it doesn’t turn, it could make a beeline for New Orleans and the central Gulf Coast. I have noticed the same thing and we commiserate over that anxiety. After my visit with Elliott Gallery, I return to the symposium and one of the sessions I most look forward to about “Rough South Regionalism,” including papers about Harry Crews and Larry Brown, has been canceled due to the participants being in the projected path of Irma. The closing reception includes a session with the editors of four regional academic journals and the opportunity to say goodbye to new friends and colleagues. By this time also, Irma is making the predicted turn northward. 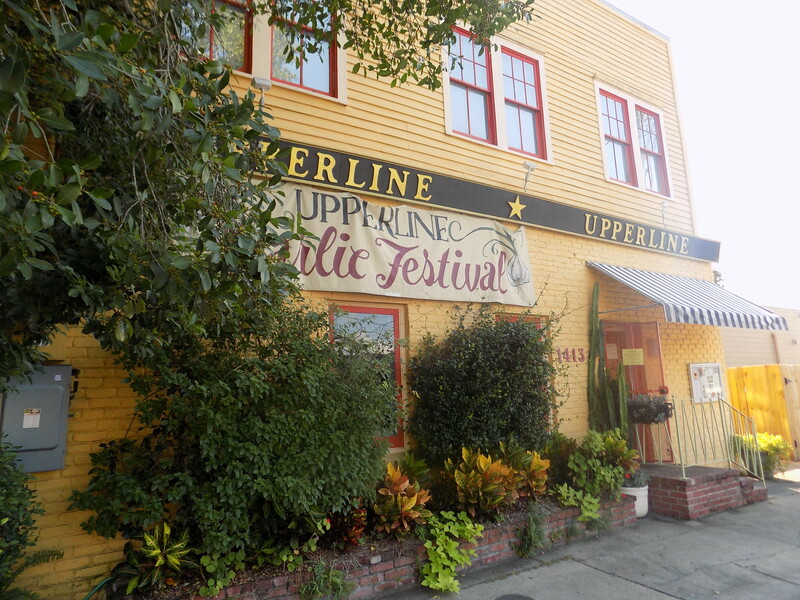 I am asked for restaurant recommendations for future trips to New Orleans and I highly recommend Upperline, among others. “What sets Upperline apart?” I am asked. What I do not mention is that I have a reservation at Upperline tonight (www.upperline.com). JoAnn Clevenger, the restaurateur of Upperline, is always present at the restaurant. It is full of artwork she has collected – most of it New Orleans-themed – and she circulates among the diners, seemingly interested in everyone’s story, throughout the evening. She glides through the restaurant as if it is her own private salon; in ways, I guess it is. I try to make an Upperline dinner a feature of every visit to New Orleans. Andrew Thornton is the Upperline chef, but the menu is very evocative of JoAnn. She is a fan of garlic so a “Garlic Festival” is a menu feature each summer (including garlic in the dessert). Thomas Jefferson is a hero so a Jefferson dinner is a recurring event and the menu is always peppered with dishes from Jefferson’s Monticello. Dorothy Parker-themed cocktails are featured on the drinks menu. The menu is highly influenced by Creole cooking styles and I have never had a bad bite at Upperline. Tonight I stay traditional, ordering Oysters St. Claude as an appetizer. My entrée of Sauteed Drum Meuniere is on a bed of succulent cooked greens and cornbread. For dessert, I order a pecan encrusted Crème Brulee. As I wait for my cab, a waiter asks me where I’m visiting from. I tell him I live in Huntsville but Birmingham is “home.” His immediate response is “Frank Stitt.” He’s a fan of the Birmingham chef and we discuss Highlands Bar and Grill’s perpetual James Beard nomination as Best Restaurant. About that time, JoAnn walks up and I say, “And we also need to figure out what we need to do to get JoAnn the James Beard Restaurateur of the Year award.” She has been a finalist or semi-finalist many times but, like Highlands, she’s never taken home the prize. Anyone who has ever dined at Upperline knows she deserves it. Sunday, 9/10/2017: I decide to check out early since I have a long drive ahead with a stop in Birmingham. The bellman who takes my bags down tells me that most of the new guests arriving since Friday are people from Florida, escaping Irma. I tell him that maybe for those taking shelter in New Orleans, the way New Orleans has sprung back will be an encouragement for whatever they might be returning to in Florida, Georgia, and the Carolinas. It’s a glorious morning in New Orleans. 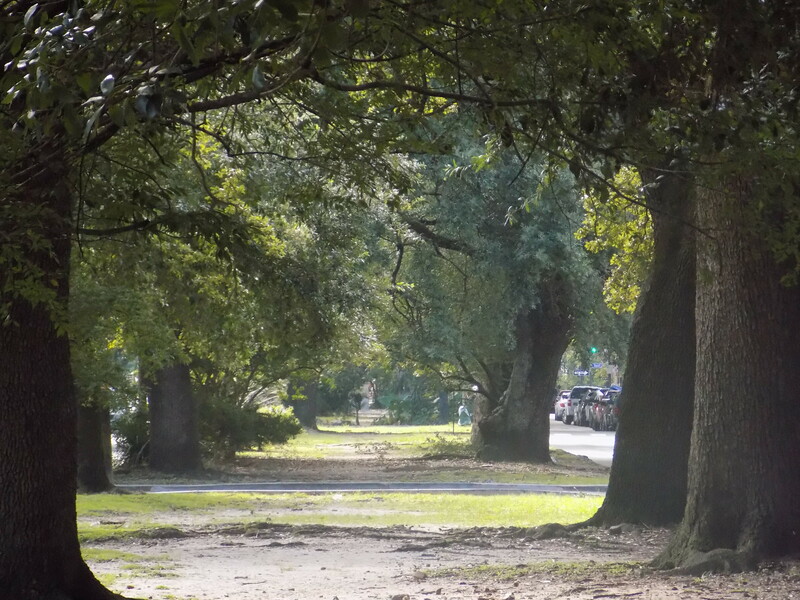 I take a photo of the Esplanade neutral ground as I leave the Quarter. 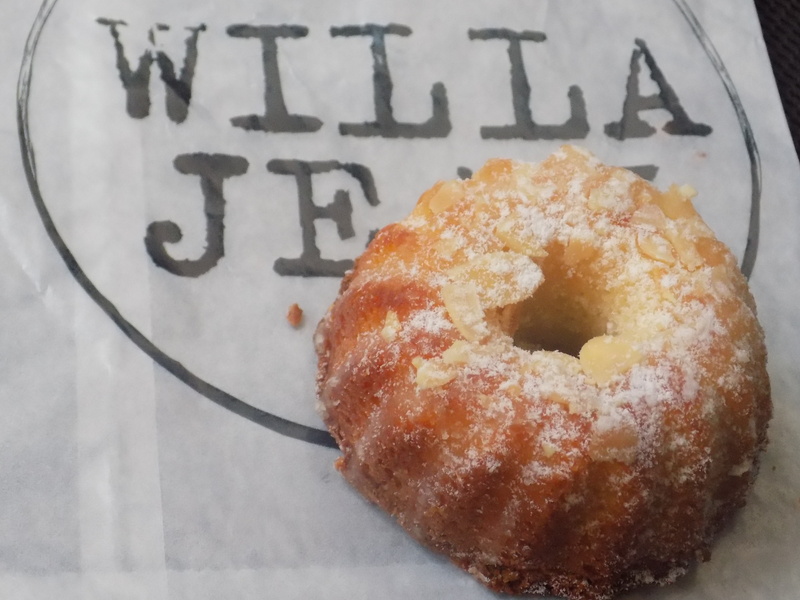 I drop by Willa Jean, grab an almond mini-bundt cake and café au lait for the road, and get onto I-10 east toward the lake, out of the city. Some have gone and some remain. With lovers and friends I still can recall. In my life I’ve loved them all. I turn off the radio. By the time I get to Birmingham, Monday school closings are being announced. The remnants of Irma are headed our way. This entry was posted in New Orleans and tagged American Literature Association, Andrew Thornton chef, Catherine Martens Betz, Chef Kelly Fields, Commander's Palace, Ella Brennan: Commanding the Table, Elliott Gallery New Orleans, Faulkner House Books, Frank Stitt, Gimme Shelter, Highlands Bar and Grill, Hotel Monteleone, Hurricane Irma, In My Life by Lennon and McCartney, James Beard Awards, James Coignard, Joan Didion, JoAnn Clevenger at Upperline, John Besh, Leah Richard, Merry Clayton, Neutral Ground in New Orleans, New Orleans, Paul Prudhomme, The Bright Star Restaurant, The Rolling Stones, Tory McPhail, Upperline Restaurant, Willa Jean restaurant, William Faulkner, WWOZ-FM New Orleans on September 12, 2017 by gedwardjourney.